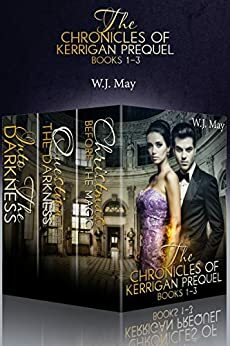 A Boxset collection of the first 3 books in the Chronicles of Kerrigan Prequel Series! Learn how it all began … before the magic of tatùs. When Argyle invites his best friend, Simon Kerrigan, home for the Christmas holidays, he wants to save Simon from staying at Guilder Boarding School on his own. Simon comes along and doesn’t expect to find much more excitement in the tiny Scottish town where Argyle’s family lives. Until he meets Beth, Argyle’s older sister. She’s beautiful, brash and clearly interested in him. When her father warns him to stay away from her, Simon tries, but sometimes destiny has a hope of it’s own. Learn how it all began … before Rae Kerrigan. The sins of the father are the sins of the son. What did Rae’s father do that put fear in people’s eyes at the name Kerrigan? Simon Kerrigan is a bright kid. He likes to ask questions and push adults in their way of thinking. He’s falling for a girl he’s been warned to stay away from. Tempted by forbidden love, he also must face the biggest challenge of his life: receive a tattoo on his sixteenth birthday. This ink is going to give him a supernatural ability unlike anyone before him. When secrets of the past begin to reveal themselves, he questions everything he’s ever known. Pressure from Guilder Boarding School and the Privy Council only confuse Simon more as he struggles to find himself. How hard will he have to shake the family tree to find the truth about the past? After a mysterious attempt is made on his life, Simon Kerrigan has more questions than ever, and this time, he's not the only one. The beginnings of a secret society are formed at Guilder. A society of other like-minded students all unsatisfied with the status quo. All searching for the truth. But things aren't always as they seem. When Simon gets an unexpected visitor, his entire world is turned upside-down. Suddenly, the rules that were made to keep him safe, are the only things standing in his way. Who can he trust? Can he learn to master his tatù? Most importantly, can he do it in time to protect those things that are most precious to him? SIGN UP FOR W.J. May's Newsletter to find out about new releases, updates, cover reveals and even freebies! http: //eepurl.com/97aYf http: //www.facebook.com/pages/Author-WJ-May-FAN-PAGE/141170442608149?ref=hl and http: //www.wanitamay.yolasite.com/ *Please feel free to connect with me and share your comments. I love connecting with my readers. * W.J. May grew up in the fruit belt of Ontario. Crazy-happy childhood, she always has had a vivid imagination and loads of energy. After her father passed away in 2009, from a six-year battle with cancer (which she still believes he won the fight against), she began to write again. A passion she'd loved for years, but realized life was too short to keep putting it off. She is a writer of Young Adult, Fantasy Fiction and where ever else her little muses take her. This was....interesting, sort of. The first two stories are a prequel for Rae Kerrigan's series, the story of her father and how he goes wrong. The tatu idea is interesting but Simon is a rather loathsome character; power-hungry and without much honor or ethics. The last story is the now-orphaned daughter Rae arriving at the school, with no idea of what's going on or why she's there. It's the better story - Rae is the more likable character, certainly. But it's full of the standard YA cliches, and I didn't feel I was reading anything that hadn't been done by other authors a zillion times before. I'm glad I stuck it through to Rae's story - I was seriously considering deleting the trilogy purchase because I couldn't take much more of Simon's self-serving attitude - but I have no interest in continuing either series. I just finished the first three book in the presquel of The Chronicles of Kerrigan to learn about her parents and how they met. Simon and Beth are Rea's parents. This is the story of what happen that caused Simon to do all the things he did. You learn there was an attempt on his life while he was a student at the school. You learn how Tristan and Simon became friends, how the H.O.C. (House Of Cards) came to be out of stuff that happen at the school. We also learn that Beth's father for some reason or another didn't like Simon. If you have read about Rea and her friends you need to read the Prequel Series and get the back story of how her parents got together and what happen way before Rae even stepped foot onto the school grounds. W.J. May has done it again with this series. 5.0 out of 5 starsLoved these books!! I started out reading about Simon's daughter in another book and then read these. I loved the series with Rae and her friends and now these with Simon. I have to say, he didn't start out like the monster they all said. I liked being able to find out about Rae's family since you hear about them in her books. I'm so glad I read the first book by M.J. May. I absolutely love all the books I have read so far and can't wait for more!!! The stories of how Simon became a legend and how he meant Beth, the love of his life and mother of their daughter Rae. Learn Simon's and Beth's story, from beginning to the start of Rae's story. The ups and downs, understanding who he is and what his destiny is, plus how he deals with it all. Now I am starting to understand how this sweet boy becomes a legend to fear. I can see his one track mind, disregarding how others feel and what they have to say, because he feels what he has to say and do is more important...so the beginnings of a selfish "monster".